On 2 October 1959, television viewers turned on CBS to watch a brand-new show that challenged everyone, confusing some and pleasing others: it was the debut of Rod Serling’s The Twilight Zone. Critics and viewers alike had trouble defining this strange new show: was it science fiction, horror, thriller, or serious drama with heavy moral undertones? No one was quite sure, least of all the show’s sponsors. 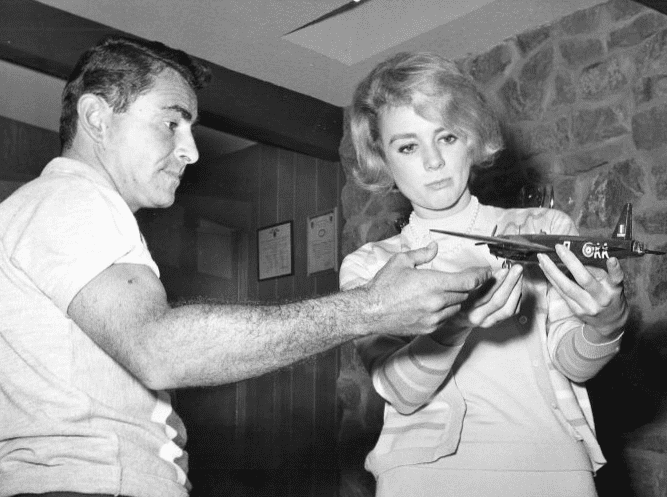 Photo: Rod Serling and actress Inger Stevens with Serling’s model airplane collection at his home, 5 January 1960. Stevens starred in “The Twilight Zone” episode “The Hitchhiker.” Credit: CBS Television; Wikimedia Commons. At the time of The Twilight Zone’s debut, Serling was a heavyweight among television writers, having won three Emmys for his shows “Patterns,” “Requiem for a Heavyweight,” and “The Comedian.” This status gave Serling clout, and he fought an unrelenting battle against sponsors’ tight control and censorship. Serling was a maverick and a rebel, an “angry young man” who wanted to bring moral issues and cutting-edge social concerns such as racism into primetime television, at a time when the networks favored safe, non-threatening cowboy and detective shows. Serling insisted that television could be a powerful medium that challenged viewers to think and reconsider their preconceived notions. He wanted programming that was daring and imaginative, rather than dulling the audience’s minds with the same scripts over and over again. He also hated the rating system that killed many good shows before they had a chance to attract and build a sizeable following – which almost happened to The Twilight Zone. The show only gained moderate ratings and was threatened with cancellation almost from its inception. But Serling had the last laugh: The Twilight Zone ended up airing for five seasons and 156 episodes. Serling won his fourth Emmy the show’s very first season, for dramatic writing, and his fifth the next year. He also won the Golden Globe for best television director/producer in 1962. The following six newspaper articles give an indication how The Twilight Zone – and Serling himself – were perceived and received in 1959. Some articles give reactions to the show, while others present a platform for Serling to discuss his ideas and his many battles with executives and sponsors. 10:00 p.m. (Ch. 6) Twilight Zone. (Premiere) “Where Is Everybody?” Fantasy for grownups. Rod Serling’s gripping opening tale finds a man alone in a city. Some of the shots are calculated to make you jump right out of your seat, and a few of them are pips. Earl Holliman does a good job in the role of the terrorized young man. We think this series may really be a hit. “Twilight Zone” seems to have divided its viewers into those who don’t dig it and those who are wild about it. 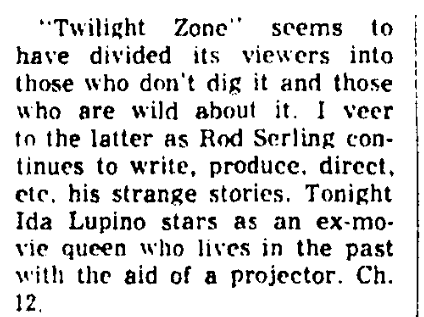 I veer to the latter as Rod Serling continues to write, produce, direct, etc., his strange stories. Tonight Ida Lupino stars as an ex-movie queen who lives in the past with the aid of a projector. Ch. 12. In this next article, Serling explains his determination to bring challenging, imaginative programming to television, and details his dislike for the rating system. It is accurate enough to say now that the 1959-60 television [season] has been launched, but such is the nature of the business that some of the new shows already are foundering. The business of television is unreasonable in demanding instantaneous success from its new program products – not success in the artistic sense, but in the coldly commercial area of audience measurement. The program, carried by the CBS-TV Network and Channel 8 in Cleveland on Friday evenings from 10 to 10:30, is unique as an experimental project by a richly-talented creative man. 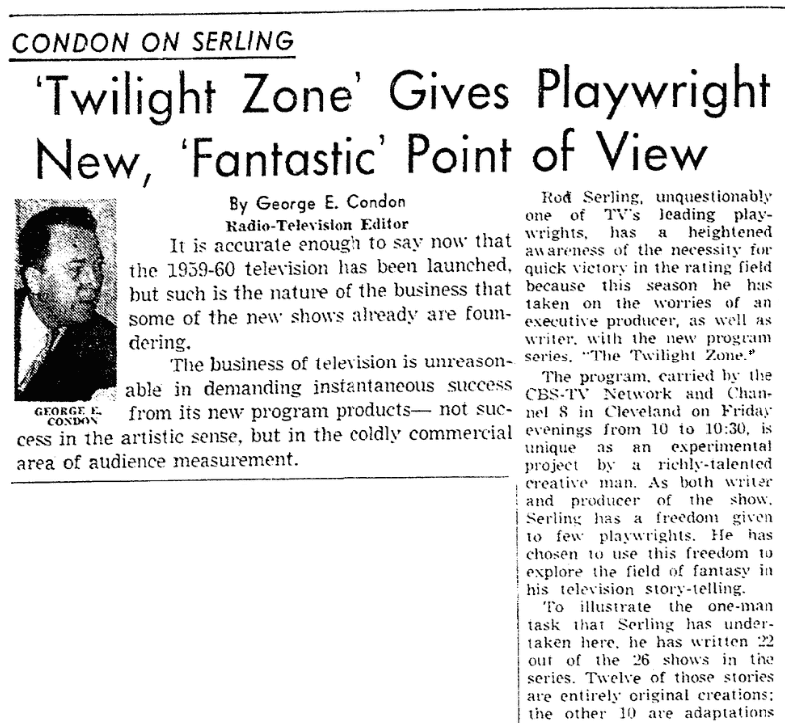 As both writer and producer of the show, Serling has a freedom given to few playwrights. He has chosen to use this freedom to explore the field of fantasy in his television story-telling. To illustrate the one-man task that Serling has undertaken here, he has written 22 out of the 26 shows in the series. Twelve of those stories are entirely original creations; the other 10 are adaptations of stories written by other writers. Serling, a graduate of Ohio’s Antioch College, could have chosen an easier, more lucrative writing assignment in 1959, but none, in his own words, that would have been as satisfying. He is the author of more than 90 television plays, including such smash successes as “Patterns,” “Requiem for a Heavyweight,” “The Comedian,” and “Bomber’s Moon.” With his heavy list of successes, he is free to pick his own writing assignments for motion pictures, stage and television. His decision this year was to experiment in television. Sponsors and networks, in demanding immediate high ratings from new programs, in his view, are not quite fair. “The key is the television audience, which has become satiated with entertainment. Program producers and sponsors don’t have enough patience with the audience, which, after all, has nineteen million shows to choose from. It takes the audience time to look over new programs and make a decision as to preference, but shows often are not given enough opportunity to prove themselves. 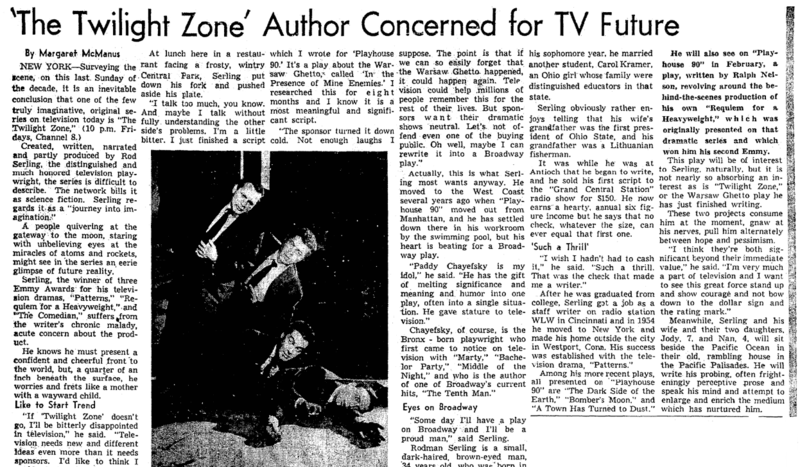 This next newspaper article details how sponsors were uneasy about The Twilight Zone’s moderate ratings, and concludes with a plea from Serling himself to television viewers, encouraging them to write him with their feedback. HOLLYWOOD – Luckily for TV viewers, Rod Serling still hopes to prove that we are not a pack of wide-eyed morons. Most of the other angry young men who were writing mature drama for TV a few years ago gave it up for the freer and lusher movie vineyards. Rod has stayed with TV because he is still angry and believes commercial TV should not be left to die of pernicious anemia. But right now the three-time Emmy winner (“Requiem for a Heavyweight”) needs our help. His first TV series, “Twilight Zone,” launched on CBS last month, is not being watched by enough people every Friday night. To the statistic-crazed men who buy TV programs, a “20” rating makes “Twilight Zone” a borderline case. Already the soothsayers in this screwball business are laying wreaths on Rod’s show. “It’s too far out,” says one. “It’s a think show and viewers don’t want to think” says another. In one of the rating polls, Rod’s series came within a point of ABC’s competing “The Detectives,” but sponsors have been known to drop a series which trailed by a single point. It is ridiculous, of course, because no rating service takes a big enough sample to be that accurate – but that’s the way the game is played. Not all of the half-dozen shows Rod has had on “Twilight Zone” so far have been good ones, but at least two have been excellent. The others still rate far above the par established this season by weekly series generally. What bothers Rod now is all of this trade talk about the series being too “long-hair” for the average viewer. Well, gentle viewers, there is an invitation. Write your opinions to Rod. You may be doing yourselves and him a favor. If you prefer watching “Twilight Zone” to a cop-and-robber series, or the Friday night fights (NBC’s opposition in most mid-West and Eastern cities), it’s a good time to say so. Jack Benny might very well have been just a second-rate fiddle player, if this rule of thumb had been used in the early days of radio. Very few shows can build a rating in only 13 weeks. It takes that long for TV viewers to discover a new show. Rod is not running scared. Naturally, he would like to prove a point – namely, that you can be a success on TV without a trench coat or a horse. But it is not going to be any skin off his hide if he is proven wrong. He can quit being angry and join his fellow writers at the movie studios. The pay is good and there are no rating points to worry about. 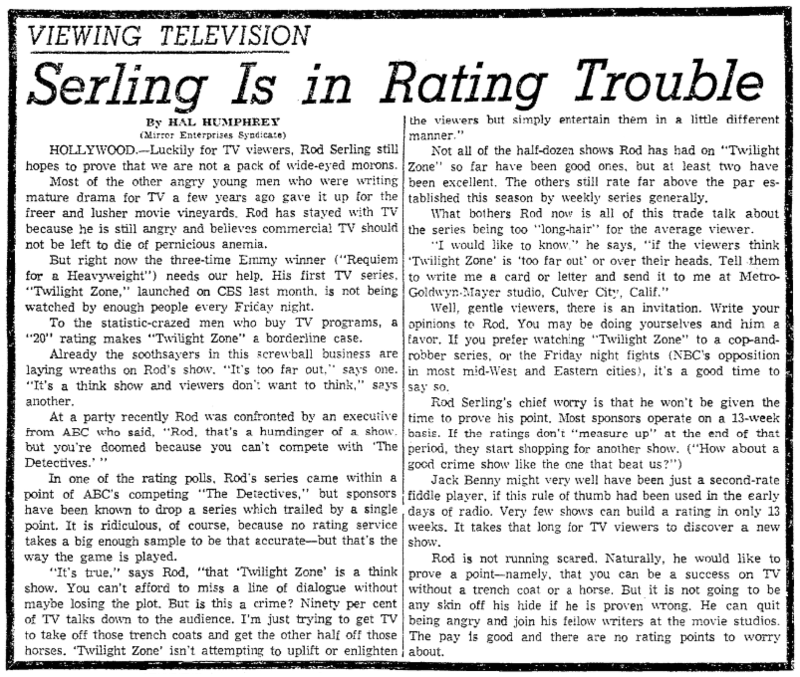 This next article reports the astonishing response of viewers to Serling’s plea for feedback, demonstrating that the show had already gained loyal followers. HOLLYWOOD, Calif. – “My faith in TV viewers has been reaffirmed,” says Rod Serling, writer-producer of the CBS “Twilight Zone” series. The cause for Rod’s rather oratorical outburst is a huge bundle of mail (more than 2,500 pieces so far) which has accumulated in a corner of his MGM studio office during the past three weeks. To date, only eight of the hundreds of viewers writing to Rod have knocked “Twilight Zone,” and even those eight didn’t feel it was too much of a strain on their mental capabilities. “They had some very aware comments about their dislike for the series, and two of the eight made valid points about the characters being too vague in some instances,” says Rod. Nearly all of the comments included a complete disenchantment with most of the private-eye and western type shows on TV now. They welcomed “Twilight Zone,” they said, because it challenged them to do a little thinking, and they could remember the plots the next day. Mrs. Diehl’s reaction was quite typical, whether the letters came from Philadelphia, New Orleans, Kansas City or Houston. For Rod and me, mail like this proves again that a rating (number of people watching) does not properly evaluate a TV show. No one called by a rating service is ever asked how he likes a particular program, but only if he is watching. Millions of viewers turn on their sets each night but get no stimulation. As Mrs. Diehl admits, they become vegetables and can’t recall the plots 10 minutes later, much less the name of the sponsor. Rod went to New York last week and gained a new hope for the medium, as well as for himself as a TV writer. “I have never seen such fright. Everyone is walking around white-faced. I think this quiz-payola shakeup has been a good thing. When the executives settle down again, they are going to be more interested in quality than ratings. I think already there is a trend toward less sponsor control of programs, too,” observes Rod. Within the next few weeks Rod says he will answer all of you viewers who wrote to him. That will include the girl who dispatched a three-page missive asking him for a date and assuring Rod that “I am no ugly duckling.” Also the three people who asked for jobs and the 11 who submitted manuscripts. “I heard from two Army buddies that I had lost track of since the war, too. So you see, nothing is ever a total loss,” says Rod. Occasionally, one of Rod’s contemporaries confronts him and inquires, “What are you pushin’ for – relax!” But Rod isn’t the type to relax. Television gave him his first break as a writer. His “Patterns” on the old Kraft Theater catapulted him to a position of fame and authority in the industry. There hasn’t been any drama as gutty as that on TV since then. If Rod keeps “pushin’,” we may all be saved from becoming vegetables in the living room. In this final article, Serling shares his concerns and hopes for television as a medium of great impact and potentially great influence on society. NEW YORK – Surveying the scene, on this last Sunday of the decade, it is an inevitable conclusion that one of the few truly imaginative, original series on television today is “The Twilight Zone” (10 p.m. Fridays, Channel 8). A people quivering at the gateway to the moon, staring with unbelieving eyes at the miracles of atoms and rockets, might see in the series an eerie glimpse of future reality. Serling, the winner of three Emmy Awards for his television dramas, “Patterns,” “Requiem for a Heavyweight,” and “The Comedian,” suffers from the writer’s chronic malady, acute concern about the product. He knows he must present a confident and cheerful front to the world, but, a quarter of an inch beneath the surface, he worries and frets like a mother with a wayward child. “If ‘Twilight Zone’ doesn’t go [i.e., make it], I’ll be bitterly disappointed in television,” he said. “Television needs new and different ideas even more than it needs sponsors. I’d like to think I could start a trend, push off some of the westerns and detectives for the kind of shows that only television can do. At lunch here in a restaurant facing a frosty, wintry Central Park, Serling put down his fork and pushed aside his plate. “I talk too much, you know. And maybe I talk without fully understanding the other side’s problems. I’m a little bitter. I just finished a script which I wrote for ‘Playhouse 90.’ It’s a play about the Warsaw Ghetto, called ‘In the Presence of Mine Enemies.’ I researched this for eight months and I know it is a most meaningful and significant script. Actually, this is what Serling most wants anyway. He moved to the West Coast several years ago when “Playhouse 90” moved out from Manhattan, and he has settled down there in his workroom by the swimming pool, but his heart is beating for a Broadway play. “Someday I’ll have a play on Broadway and I’ll be a proud man,” said Serling. He enlisted in the paratroops the week he graduated from high school and he served three years in the Pacific. When he was released from service, he entered Antioch College on the GI Bill and in his sophomore year, he married another student, Carol Kramer, an Ohio girl whose family were distinguished educators in that state. Serling obviously rather enjoys telling that his wife’s grandfather was the first president of Ohio State, and his grandfather was a Lithuanian fisherman. It was while he was at Antioch that he began to write, and he sold his first script to the “Grand Central Station” radio show for $150. He now earns a hearty, annual six-figure income but he says that no check, whatever the size, can ever equal that first one. He will also see on “Playhouse 90” in February a play, written by Ralph Nelson, revolving around the behind-the-scenes production of his own “Requiem for a Heavyweight,” which was originally presented on that dramatic series and which won him his second Emmy. This play will be of interest to Serling, naturally, but it is not nearly so absorbing an interest as is “Twilight Zone,” or the Warsaw Ghetto play he has just finished writing. These two projects consume him at the moment, gnaw at his nerves, pull him alternately between hope and pessimism. Meanwhile, Serling and his wife and their two daughters, Jody, 7, and Nan, 4, will sit beside the Pacific Ocean in their old, rambling house in the Pacific Palisades. He will write his probing, often frighteningly perceptive prose and speak his mind and attempt to enlarge and enrich the medium which has nurtured him. Note: An online collection of newspapers, such as GenealogyBank’s Historical Newspaper Archives, is not only a great way to learn about the lives of your ancestors – the old newspaper articles also help you understand American history and the times your ancestors lived in, and the news they talked about and read in their local papers. Are you a fan of The Twilight Zone? Please share your stories with us in the comments section.